HANOVER, Germany (Bloomberg) -- Continental AG returned to a profit in the first quarter after eliminating jobs and delivering more components. Europe’s second-largest car parts supplier said full-year sales growth may beat its forecast. Earnings before interest and taxes were 494 million euros ($652 million) after a year-earlier loss, compared with the 370 million-euro average estimate of four analysts compiled by Bloomberg. Revenue jumped 40 percent to 6 billion euros, also surpassing estimates, Hanover, Germany,-based Continental said. CEO Elmar Degenhart forecast full-year sales may rise as much as 10 percent if market development “continues to be positive,” double a February prediction for at least a 5 percent increase. The manufacturer cut 4,700 jobs last year and is seeking to trim debt after its 2007 takeover of Siemens AG’s VDO auto-component business. “These are very strong numbers, driven by a significant increase in production,” said Daniel Schwarz, a Frankfurt-based analyst at Commerzbank AG. Continental rose as much as 1.16 euros, or 2.7 percent, to 43.49 euros and was up 1.9 percent as of 9:28 CET in Frankfurt trading. The stock has gained 18 percent this year. 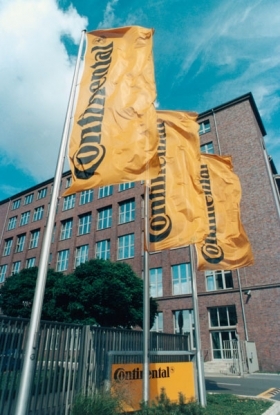 Continental, also Europe’s second-largest tiremaker, said full-year adjusted earnings before interest and tax (EBIT) will rise “significantly” from a year earlier. Last year, the manufacturer reported its biggest annual loss in at least two decades. In the first quarter of last year, Continental had an EBIT loss of 165 million euros. “The outlook for European business will weaken somewhat in the second half of the year with scrappage premiums expiring in some countries,” Commerzbank’s Schwarz said. Schaeffler Group, the world’s second-largest roller-bearing maker, controls 75 percent of Continental’s stock after a debt-financed takeover offer made as financial markets were collapsing in late 2008. The German family-owned manufacturer, which is strapped with more than 12 billion euros in debt from the transaction, aims to combine with Continental. A merger of their operating units is targeted after 2010, the companies said April 26. Continental is scheduled to report detailed first-quarter earnings May 4. Continental sold 1.1 billion euros in new shares in January to help finance a 3.5 billion-euro debt payment due in August. The remainder of the debt will be refinanced with a 2.5 billion- euro loan to be repaid in 2012. The parts supplier intends to sell about 1.5 billion euros in high-yield bonds as early as May to spread out its debt repayment dates, people familiar with the plan said last month. A first attempt was scrapped in February after Schaeffler wanted to make the bonds callable, which would increase costs for Continental, the people said at the time.